Hello everyone! It gives me immense pleasure to share that today is the anniversary of my blog, Ashish Vision which came into existence eight years ago i.e in 2011. 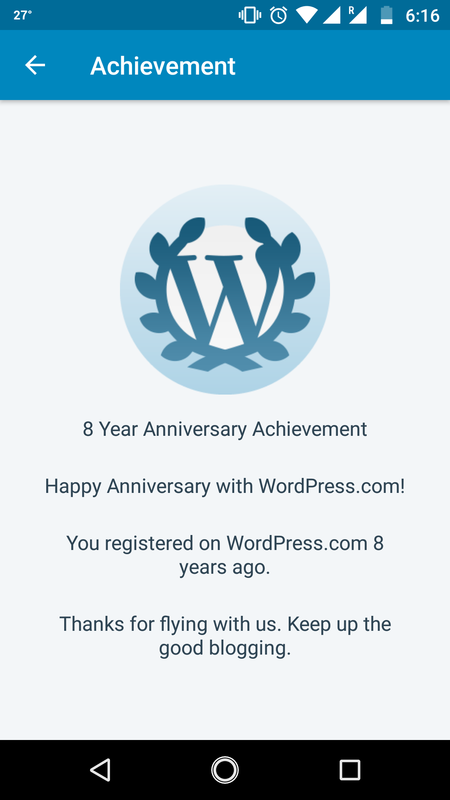 It was on this day that I created my blog and started my journey in blogging world. 🤗😊 When I started, I have never expected that I will be able to continue for so long but thanks to all my readers and friends across the globe for making this happen. I would like to thank all of you for your overwhelming support and encouragement which keeps me going till today. 🙏🙏🙏 I will continue to write and share my literary pieces with you all. You all are very good, supportive and motivating. In these eight years of my journey, I have learnt a lot from all you and still I am learning from your posts and your views. 👍🕺. Writing is an art. When a writer pens down his creativity with the use of magical words, a new literary piece is born. It takes immense effort to write, from beginning to the end. What to write and how to present it? It happens several times when you thought of writing something chosen but came up writing on something else. Isn’t it??? Even though when you come up writing something else which you didn’t thought of doing so and when the end result is satisfying, it is again a new creation. This happened with me several times. I think to write something specific and come out of writing something else. Writing gives me satisfaction and I am sure it gives satisfaction to all who writes. But what happens when the writers are unable to write for some time or the thinking ability slows down for a while. The situation where writers are unable to produce their literary pieces is what we call the “writer’s block”. It is the situation where the author loses the ability to produce new work or experiences a creative slowdown. This is quite natural and happens with every writer. It gives the writer to take rest from writing for a while and come back with refreshing new literary pieces. Going forward, refreshment does play a role when one comes back. As the mind is ready, devoted and the best part is, one writes from his heart. In the crowd of millions. It’s difficult to find the right one. During the good and bad times. It’s not easy to manage the time. Life gave a lot of experience. It is better to gain the real sense. Startling situation came often in life. I don’t have any complaints about life. The world is full of fake faces. It is difficult to find the right face. Having no tragedy is a tragedy. Better to face the tragedy. Going in the dark side. I often had the bad side. Finding a shoulder to cry. I used to smile followed by cry. Done a lot to keep things intact. Rather than blocking the contact. Sometimes eyes were red and face became dark. As I have to listen to people’s bark. No issues as this is life. Startling situation often came in life. Don’t have any complaints about life.